One of the most popular mobile casino games on the go is video poker. The game is based on both luck and skill. In other words, with a solid video poker strategy and a bit of luck, you can hit the high payouts. Mobile video poker also has a few variants like Aces and Faces, Jacks or Better and Deuces Wild among others. The most common one offered at many mobile casinos is Jacks or Better mobile video poker. All video poker variants on the go are played according to a general set of rules where you hold and discard cards in order to make a good hand and win a payout. They generally differ in their pay tables. Continue reading to learn more about mobile video poker. To be able to play mobile video poker, you must first get access to a real money mobile casino that offers the game. This can be done by visiting a casino site directly on a mobile browser or by downloading and installing mobile casino app. Once the casino is set up, you need to make a deposit to your account and then chose video poker from the lobby. To play real money video poker on the go, choose your bet and press the Deal button. The random number generator built-in software will deal you five randomly picked cards. Based on the cards you have in front of you, you choose which cards to keep and which ones to give up. Touch the cards you want to hold. On the next draw, the discarded cards will be replaced with new ones. The goal of the game is to make a hand that pays out according to the pay table. In most video poker variants, to get a payout you need to make a hand of Jacks or better. One of the most popular mobile video poker variants is Jacks or Better mainly because it is the right game for all video poker fans, especially beginners, and has pretty good pay table. In addition, with the right strategy you can expect at least 99% return on this game. Jacks or Better is also the simplest mobile video poker variant to play and you can get decent payouts even with basic strategy. To play the game, choose the size of your bet and press the Deal button. Then decide which cards to keep and which cards to discard. If you get a pair of two Jacks, you will win the lowest payout according to the pay table. The highest ranked hand is Royal Flush and it pays 4,000 coins. The game also has a Doubling option that allows you to double your winnings up to 2,000 coins. 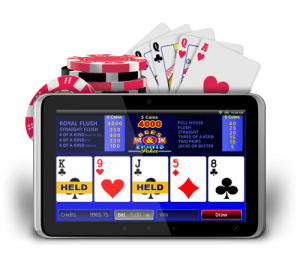 WHERE CAN I FIND MOBILE VIDEO POKER APPS? 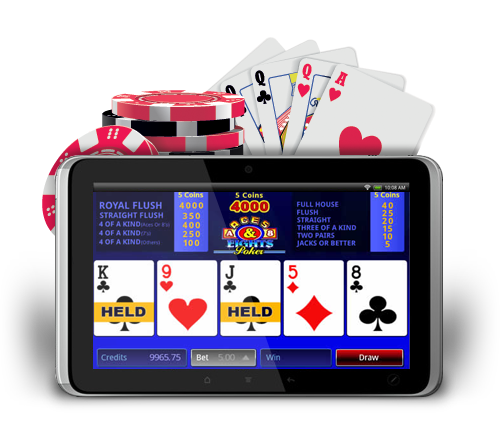 Mobile video poker apps can be downloaded from online casino counterparts that offer the game on the go. Casino-X and Joycasino are two reputable and safe mobile casinos that offer mobile video poker, namely Jacks or Better. To play the game at the Microgaming-powered casinos, download the game from the online casino site. To play mobile Jacks or Better at Royal Vegas Casino, visit the casino on your mobile browser. Both casinos are compatible with iOS, Blackberry OS and Android.